Sub-Headline: Wexford School Teacher Receives Top Award! Celebrations continued late into the night at St. Aidan’s National School in Wexford, as Mr. Bloggs received his 2017 Teacher of the Year Award. This will be his second time to be awarded the prestigious and fiercely competitive prize. ‘It’s an absolute honour to be giving you this award,’ Richard Bruton, Minister of Education told Mr. Bloggs at the ceremony. ‘If I could get all teachers to be as hardworking and dedicated as you, I could easily cut the number of teachers by half.’ Mr. Bloggs told the minister that he thought that would be a great idea, and suggested he first try out his new policy in the Dáil. Previous pupils of Mr. Bloggs were in attendance last night. Among them three Nobel Prize winners, two Academy Award nominees, a Booker prize winner and an almost runner up in the Eurovision song contest. Mr. Bloggs will also be appearing on the Late Late Show this Friday. ‘I can’t wait to meet him,’ Ryan Tubridy said. RTÉ is believed to have offered Mr. Bloggs his own reality show - Super Teacher, but he has sadly declined. 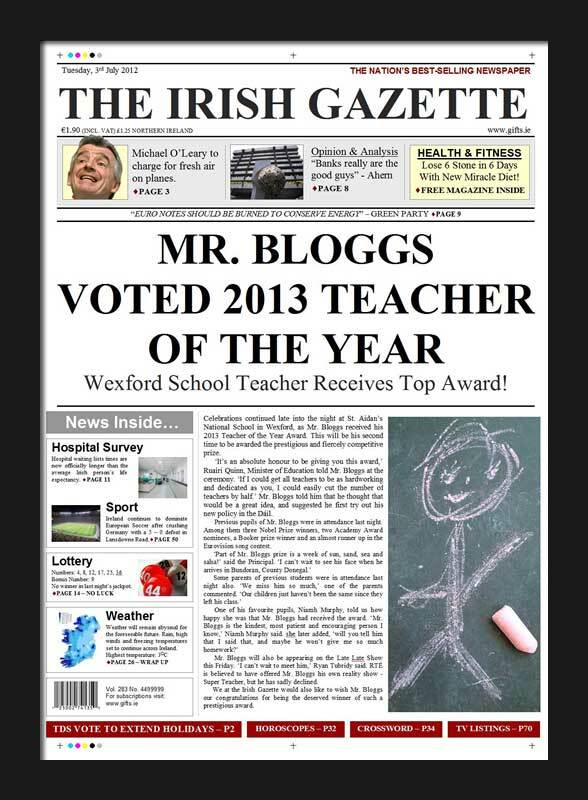 We at the Irish Gazette would also like to wish Mr. Bloggs our congratulations for being the deserved winner of such a prestigious award.